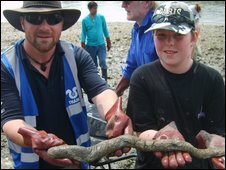 An ancient blood-sucking fish has been found in the Thames by a 13-year-old boy. 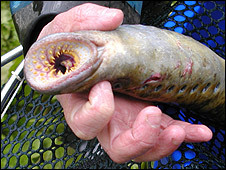 The sea lamprey, an eel-like creature with a sucker-shaped mouth surrounded by teeth, predates the dinosaurs. But they only venture into fresh water to breed if it is very clean, which is why experts said Oscar Bridge's find is significant. In the 1960s the Thames was so polluted scientists declared it "biologically extinct" after a survey. Oscar was taking part in a sponsored clear-up of a riverbank near Fulham's Craven Cottage stadium when he made the discovery. "I picked it up and it looked like an eel," he said. "I did get a shock when I saw the mouth." He added: "I really like animals - especially creepy ones like that." What Oscar had found proved to be a 15.5in (40cm) long sea lamprey, one of the most ancient creatures on earth. Like the shark and the crocodile, sea lampreys have barely changed over thousands of millennia. The parasitic creature attaches its circular mouth to larger creatures before sucking out their insides. Chris Coode is river programmes manager for Thames21, the charity that organised the clean-up. He said: "We have only found one or two in the 15 years we have been cleaning up the Thames. "The fact they are coming back is a really good sign. "The Thames is now one of the cleanest city rivers in Europe." He added: "The lamprey was dead, but it is not a bad thing - because they die immediately after spawning." On Sunday lampreys were found in the River Wear, County Durham. The fish was once considered a delicacy - and King Henry I, who lived in the 11th Century, was reputed to have died from eating too many. However, Oscar said: "It absolutely stank - a horrible fishy smell."